The Roman Empire derived its strength from its military conquests: overseeing territories across Europe, Africa, and Asia. Before Christianity, emperors were praised and honored for their successes on the battlefield. As Christianity took root throughout Rome, it was used as a means to elevate emperors to an even greater status: raising them from successful imperialists to divinely appointed leaders. The below excerpt from Rome Resurgent: War and Empire in the Age of Justinian breaks down how the Romans incorporated Christianity into their imperial culture. Throughout imperial history, the prime virtue required of all Roman emperors was victory: the capacity to win on the field of battle. This changed not a jot with the advent of Christianity, for an extremely straightforward reason. Military victory had an ideological and political impact which neither the religious nor civilian dimensions of the imperial job description could possibly match. Both of the latter could be trawled (and regularly were) for possible signs of divine favour (excellent doctri­nal settlements; laws which secured the operation of civilitas, etc. ), but an emperor’s actions on these fronts were always open to question. Doctrinal settlements always involved losers, who continued to deny, often for dec­ades, the legitimacy of what had been decided. Military victory, by contrast, had a legitimizing power which no other form of imperial activity could even begin to match. There could be no clearer sign of favour from an omnipotent divinity than a thumping military victory over barbarian opponents who, by definition, stood in a lower place in the divine order of creation. Throughout imperial history, therefore, while huge effort was put into presenting every imperial act as fully in tune with the divine plan for humankind, winning military vic­tories possessed an overwhelming ideological cache. Even if an emperor, like the young Honorius, did not campaign in person, his divinely chosen legitimacy could still be made incontestably manifest through the mili­tary victories of his generals. The ideological circle was thus closed. A legitimate emperor brought divine support, which meant nothing if not victory on the battlefield. Correspondingly, military success generated a level of political legitimacy which no other imperial action could ever hope to reach. As a result, claiming military victory—because it was the ultimate sign of divine support—loomed large in the propaganda of all Roman rulers, early or late. From the time of Constantine’s immediate predecessors— the tetrarchic emperors Diocletian and his colleagues—emperors claimed and carefully recorded victory titles: adding adjectival forms of the names of defeated enemies to the lists of their own titles. Thus Parthicus, Alamannicus, Gothicus, and many others were added to Caesar, Augustus, and Pontifex Maximus. The tetrarchs even added numbers after each title to indicate just how many times they or one of their colleagues had defeated a particular opponent. Titles like VII Carpicus—‘victor seven times over the Carpi’—became commonplace. The fixation with num­bers declined after Constantine but not that with victory. Whenever an emperor’s name was mentioned, whether they liked it or not, his subjects were confronted with a litany of victory which underscored the legitimate, divinely supported nature of the regime. A legitimate emperor brought divine support, which meant nothing if not victory on the battlefield. These occasions were many and varied. Imperial titulature appeared in all official imperial pronouncements: everything from brief letters to formal laws. It also featured on many inscriptions, most of which were dated by the names of consuls, an office which emperors regularly held in the late Roman period. Most of the public life of the empire, whether cen­tral and imperial or more local, involved formally shouted acclamations where an emperor’s titles would also figure. Every meeting of the many hundreds of town councils of the late Roman world began with such acclamations (although the minutes of only one have come down to us), as did every formal imperial ceremony, not least those carefully orches­trated moments of arrival—adventus—which greeted an emperor’s entry into any of his cities. On all these occasions, an emperor’s military rec­ord was not only held up to general public view in titulature outline but usually discussed in more detail. Most imperial ceremonies also involved a formal speech of praise—panegyric—in the emperor’s honour, given by some lucky orator who could use it to advance his own career. These speeches could take many forms, but a commonly utilized model devoted a specific section to an emperor’s deeds in war. Even where another form was adopted, some reference to the current emperor’s success in warfare was still de rigueur. Beyond such specific references, the point was reinforced by a great deal of more general allusion to the fact that divine support had shown itself in the current emperor’s capacity to generate victory. The figure of a submit­ting barbarian played a huge role in late Roman iconography. A staple of coinage types—often accompanied by an appropriate inscription such as debellator gentes (‘conqueror of peoples’)—was the supine barbarian lying at the bottom of the reverse just to remind everyone that the emperor defeated such enemies as a matter of course. Similarly defeated barbar­ians of various kinds also appeared regularly in the engraved reliefs, not least on the triumphal victory arches, with which emperors liked to dec­orate the larger cities of their empire. Submitting barbarians were the natural accompaniment of divinely supported, victorious Roman emper­ors, spreading the general message that the current regime was ticking all correct ideological boxes. The ideologies of Roman imperium, only slightly modified by Christianity, thus defined an overarching imperial job description, not directly in terms of dictating a series of day-to-day functions but, at least as important, by setting a series of targets which had somehow to be hit. A legitimate Roman emperor was not a secular ruler in modern under­standings of the term but one chosen directly by the supreme creator divinity of the entire cosmos to maintain the key pillars of rational Roman civilization—education, city life, the rule of written law, the welfare of the Christian Church—by which humankind was destined to be brought into line with the divine plan and in return for which the divinity would guarantee that ruler’s success against all comers. Featured image credit: banner header easter cross sunset by geralt. Public domain via Pixabay. 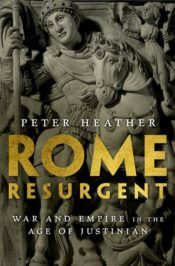 Peter Heather is Professor of Medieval History at King's College London, and author of The Fall of the Roman Empire, Empires and Barbarians, and The Restoration of Rome. He is also the author of Rome Resurgent: War and Empire in the Age of Justinian.